Have you learned yet that I’m in a current state of obsession with Green Smoothies?? I have FOUR green smoothie recipes fully prepared and photographed and ready to share with you (I had a little too much time on my hands over my christmas break). My blender has really been proving it’s worth lately. Which, for the record- my blender is a rather cheap hand me down blender that my was my husband’s before we even met. So, in case you think that you need a fancy high powered blender to be a smoothie enthusiast, you don’t! THIS is almost the exact blender that we have and I have no plans of upgrading any time soon. We recently broke down and got a Costco membership (which I’m in love with-by the way) which means that my bags of spinach and kale are now 5 times the size. It’s such a good price for those giant bags of greens but with just 2 of us, there’s simply NO way that we could consume that much spinach and kale. The first month I threw away/ tried to convince my chickens to eat a good bit of greens (they didn’t care for it, in case you were curious). My solution: Frozen Greens!! I’ve seen the concept for this before but had never tried it. Pay attention to when your greens are starting to go bad and don’t wait until the last minute to freeze them. If you know that they’ll go bad soon and you know that you won’t use all of them, go ahead and freeze them. I recommend this for several reasons one being that unless you have 100 ice cube molds, you won’t be able to freeze it all at the same time. You’ll need to do it in several rounds. Use as little liquid as possible. 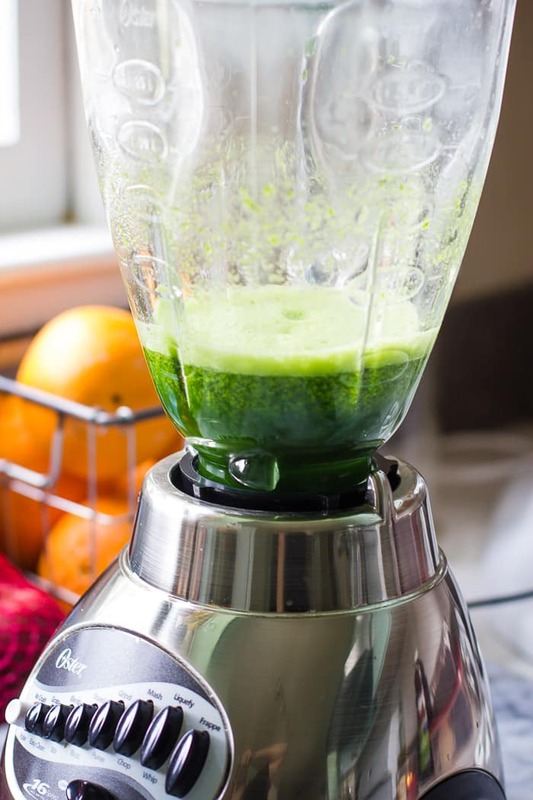 I start out by filling my blender about halfway with loosely packed greens and then add in a few tablespoons of liquid and turn the blender on. If that turns out to be not enough liquid and the greens won’t blend, add another tablespoon and then another if needed. Once that is liquefied (but there are still some chunks of green) I add in another few handfuls of greens. You shouldn’t need more liquid but go ahead and add it in if necessary. Freeze in molds and then put in baggies. It takes these greens a good bit longer to freeze than just water. I would let them sit at least 6 hours before messing with them. 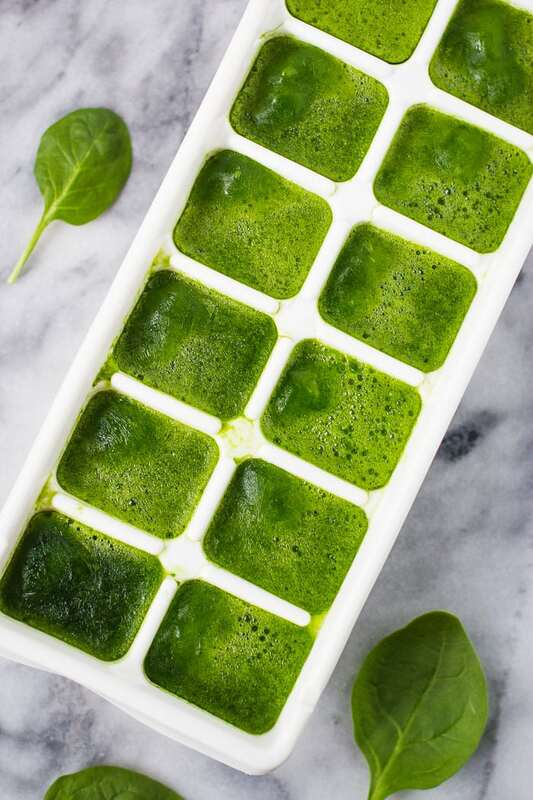 Once they’re fully solid, remove them from the ice cube molds and store in a large freezer baggy to save space (and to free up your molds for more frozen greens!). Freeze in different shapes and containers. If I’m wanting to do a giant batch all at once, I’ve gotten rather creative with what I freeze the greens in. I’ve used ice molds, muffin trays (regular and mini), coffee mugs (just filling it up about 1/4 of the way), and even baggies with the liquid just poured right in. Mix greens together. It’s totally okay to just mix your kale and your spinach and any other greens together. You could even mix in some herbs with it if it’s flavors that you like and want in your green smoothies. A little parsley in a smoothie is SO good. These cubes will affect liquid ratio in your smoothies. 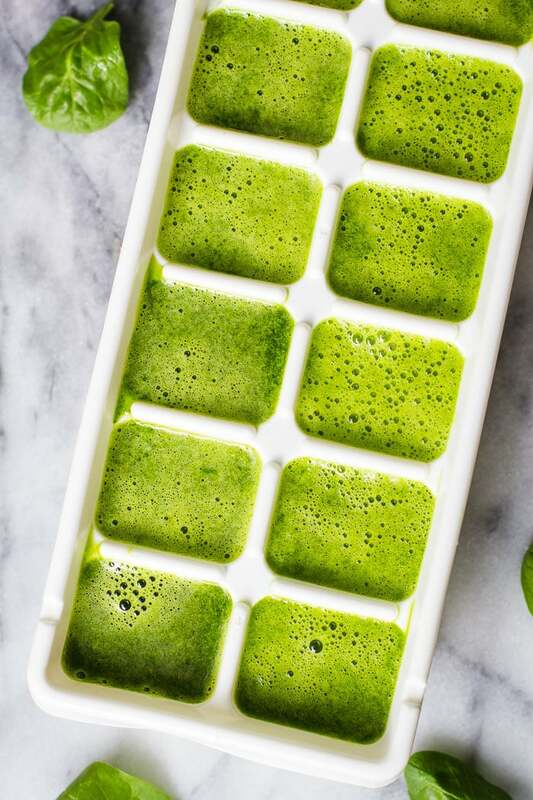 Don’t forget that you’ll need to adjust the liquid ratios when making green smoothies with these cubes. Mix in fruit! If you have fruit that is also starting to go bad (bananas, berries, really any fruit) you can throw it into the blender (basically as if you’re making a green smoothie) and freeze that with it as well. ***Do a test round. Every ice cube mold is a different size. SO, I highly suggest that you do a test round. Add in the exact amount of greens (but with a bit less liquid, see point #2) and blend. Pour that into the ice cubes and count how many cubes it makes. 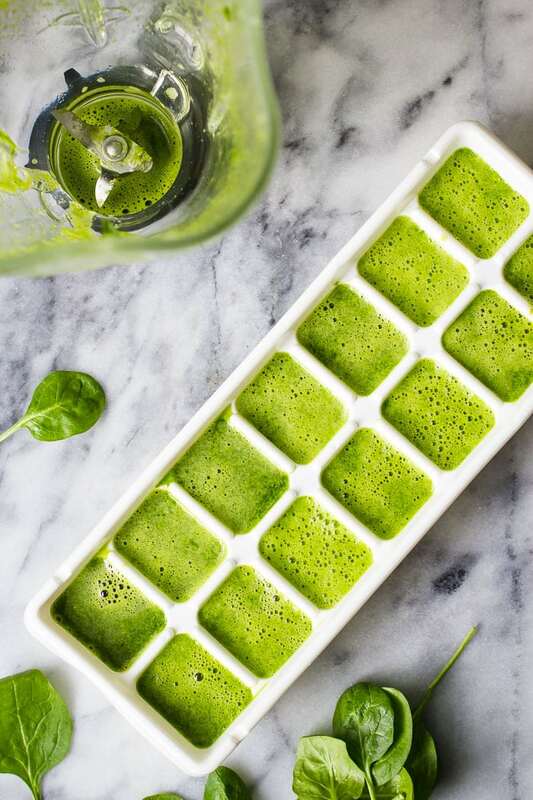 This will tell you about how many cubes of frozen greens you want per smoothie recipe. If you need more ideas for greens or if you want to know EVERYTHING that there is to know about Green Smoothies, I highly recommend checking out Simple Green Smoothies. They also just released a book that is super awesome and has some great info and recipes in it! And of course, you can check out my ever growing archive of smoothie recipes. 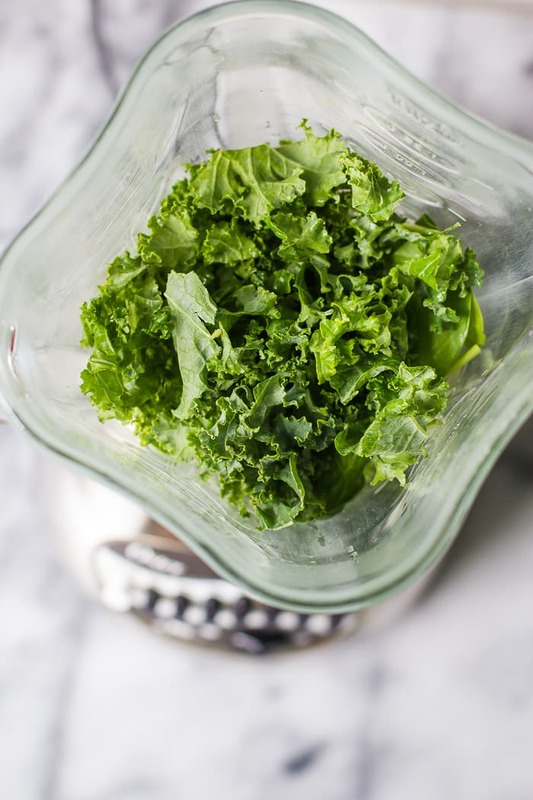 Start with 2 handfuls of the greens in the blender with a few tablespoons of liquid. Blend until just liquified. If need be, you can add in more liquid, one tablespoon at a time. Blend just until it’s liquified. It’s okay if there are still some green chunks in it. Add in 2 more handfuls of the greens and blend until liquified. Add liquid if needed, one tablespoon at a time. Repeat until all of your greens are liquified and let the blender run until there are no green chunks left. 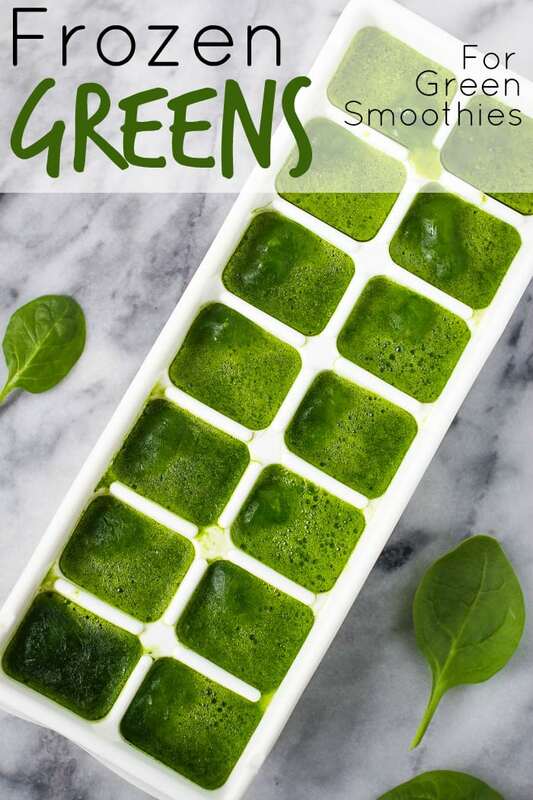 Pour the liquid greens into molds and place in a flat surface in the freezer. Remove green cubes from the mold and place in a freezer back. Store in the freezer until needed. Please note that this “recipe” is a rough estimate, obviously if you have more or less greens that need freezing, you can adjust it to fit your needs. [br]How many cubes do you need per smoothie?? See point #8 above. 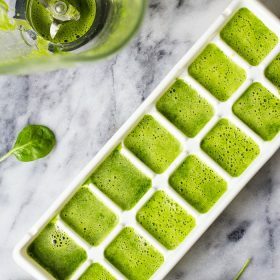 For my average sized ice mold, I need about 7 cubes of greens per green smoothie recipe (that makes 2 servings). That is exactly what I started doing–and for the exact same reason! I was buying the big spinach and kale bags at Costco for smoothies, but who could ever get through those giant bags in time? But now I make those greenie cubes right away, so that I’m working with fresh greens and the cubes at the same time (maximum freshness). It’s so nice to see your frozen greens cube trays and know that I’m not the only one . . .
You’re totally not the only one :D I always have a big bag of crazy looking green cubes in my freezer!